Spoiler Alert: the Florida Legislature isn’t even considering using this year’s budget surplus to invest in state services and state workers. Another non-surprise, recent research by WalletHub ranks Florida as one of the least fair tax systems; helping the rich get richer while overtaxing 99% of Floridians whose actual wages continue to decline or stagnate. Add to that to the results of the State of Working Florida 2015 research which concludes that the wage gap between the top 10% and the bottom 10% has grown by almost two-thirds and that although Florida’s GDP is up and unemployment is down, the poor, stuck in low-wage jobs, have been left behind. Is it just me or does it feel like a Dyson vacuum is sucking every last dime out of your American Dream? Recently, the Florida Times-Union’s editorial board commented on this problem when discussing a recent report from the Brookings Institute on the growing and very real disconnect between Americans in different income brackets and access to the American Dream. “The biggest reason for concern is the low rate in which people can move up these days,” noted the editorial board. Not mentioned by the editorial board or the researchers as a tool to reversing the “Dyson Effect”, is the roll of collective bargaining in building an economy that works for everyone. Although Florida is a Right to Work state (which limits the power of Unions overall), the right to collective bargaining is protected in Florida’s constitution. That being said, almost yearly, the Florida Legislature attempts to weaken that right or dismantle it altogether. Because of the power of collective bargaining, according to BLS data from 2011, workers’ pay plus benefits for a 40-hour week was $1,508 for a union employee and only $1,083 for a non-union worker. That’s a gap of $425 a week! Clearly, collective bargaining is a powerful tool to achieving better working conditions, compensation, healthcare and other benefits which add up to a better life. A recent poll from Gallup shows that Americans are once again looking to collective bargaining through Unions as a vehicle to correct our out-of-balance economy. 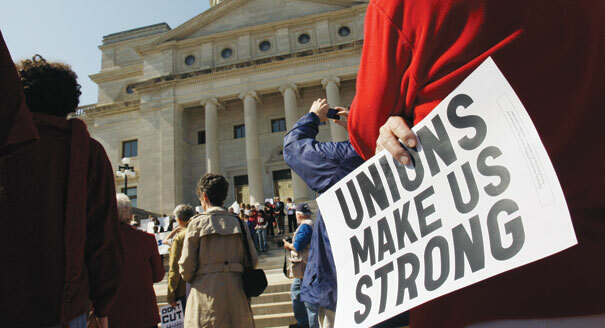 Since 2008, the public approval of unions has climbed 10 points, to nearly 60%. Women, people of color, and people under the age of 35 have the most positive views of Unions. Not surprisingly, these groups also endure the most inequality in this economy, and they’re the same groups that benefit the most from joining a Union. Black women who belong to Unions earn 34% more than their non-union counterparts, and Latina women make 46% more. These are the statistics that the high-priced political consultants need to be studying because Florida will again be a pivotal state in 2016 and our electorate will be one of the most diverse in the nation. Female and young voters will wield decisive influence in races up and down the ballot and they’re looking for candidates whose policies will give them a chance to move-up the economic ladder. All of Florida benefits when families have the opportunity to move-up the economic ladder and attain the American Dream. That economic ladder is only as strong or as weak as the collective bargaining foundation it is built on.